EnviroSim is pleased to announce the latest issue of “The BioWin Advantage” e-tech newsletter. This release discusses Simulating the Trickling Filter. 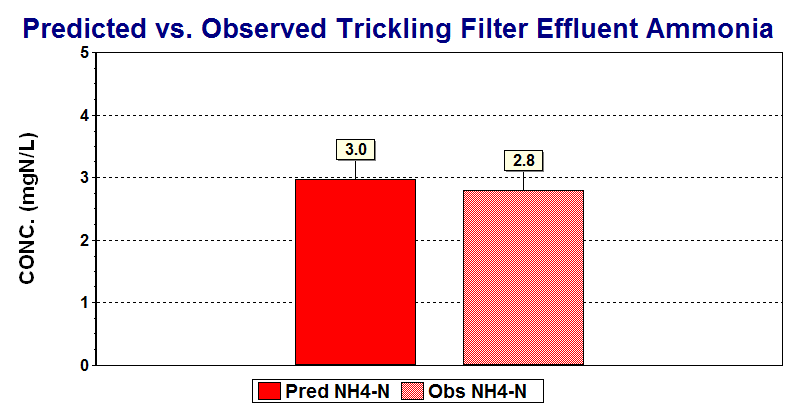 Introducing the Trickling Filter A Trickling Filter (TF) process flowsheet element was added in BioWin 4.0. This document will describe the features of the TF element and demonstrate its application in a whole-plant simulation. The example file used in this issue was set up in BioWin 5.0. The TF unit can be configured for various default media packing types (e.g. rock or plastic media), or the user can customize packing characteristics. The flowsheet image for the trickling filter changes depending on the type of media selected. An example model flowsheet for a two-stage trickling filter plant would look like the configuration shown in Figure 1. In this flowsheet two trickling filters with Structured plastic (crossflow) media are used. On the Dimensions tab the user can specify the type of trickling filter media to be used. The trickling filter elements in BioWin are assumed to be 100% full of media. The following media choices are available (Figure2): Rock, Horizontal, Structured plastic (crossflow), Loose media (random), and Custom. Toggling between the first four options of this list changes the specific area and specific volume (i.e. the volume of liquid displaced per unit volume of media) fields to commonly accepted values for those parameters. For custom media, the specific area and specific volume can be adjusted. The total thickness of the liquid layer covering the biofilm can be specified for any type of media. This is used to calculate the hydraulic residence time of the trickling filter. Making this parameter larger will increase the hydraulic residence time, and making it smaller will decrease the hydraulic residence time. For any media type, not all of the media surface area is available for gas transfer. For example, pieces of media rest against each other, blocking off part of the surface and reducing the area available for gas transfer, and the area for gas transfer is less than the media surface area. 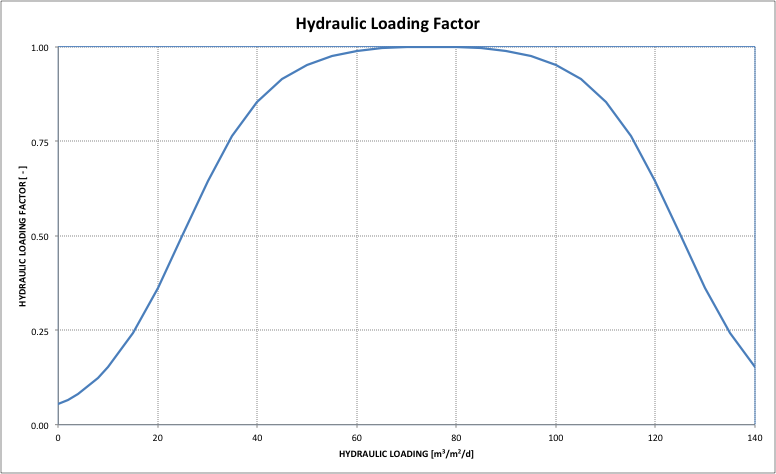 The Effective Area Fraction specifies the fraction of the media area available for gas transfer area (liquid/gas interface) under optimal hydraulic loading conditions. We can think of this as the fraction of media surface over which the liquid film flows when liquid is optimally distributed over the filter cross-sectional area. The Effective Area Fraction may be quite different for different media types, and probably also is somewhat different for freshly installed media compared with media that has been operational for some extended time. Adjusting the value of the Effective Area Fraction provides a means for coarse calibration of filter performance. Oxygen transfer is the most important factor in determining trickling filter behavior. In addition to the gas transfer area mentioned above, the user also has considerable flexibility to manipulate aeration through specifying DO concentrations or air flow rates, and selecting whether to model gas phase composition on the Operation tab. DO concentrations in the liquid phase can be specified as uniform for each section, or BioWin can model the profile through the filter. Sectional element : The depth of the trickling filter is divided into three sections or “slices” of equal height with liquid distributed evenly over the top surface. The sections are used for modeling aspects such as oxygen transfer from the top of the trickling filter to the bottom if the gas phase modeling feature of BioWin used. For example, when dissolved oxygen concentration is specified for the trickling filter and the gas phase modeling is on, the specified dissolved oxygen concentration value is applied to the top section of the trickling filter. BioWin models the gas-liquid mass transfer in all three sections and the dissolved oxygen concentration is calculated for the middle and bottom sections. The sections are also used to simulate removal gradients down the depth of the trickling filter. Fixed film model : The fixed biofilm model used in BioWin (applied to both media bioreactor and trickling filter elements) belongs to the class of 1D models as described by Wanner and Reichert (1996) and Reichert and Wanner (1997). Fundamental equations are listed in the two references. The difference between the models in the references and in BioWin is that in the two papers a biological model including six processes was used for biological reactions but in BioWin the biological model (ASDM) includes over 80 biological processes and gas transfer processes. For the trickling filter, the parameters related to the fixed film model can be changed under the Model tab. 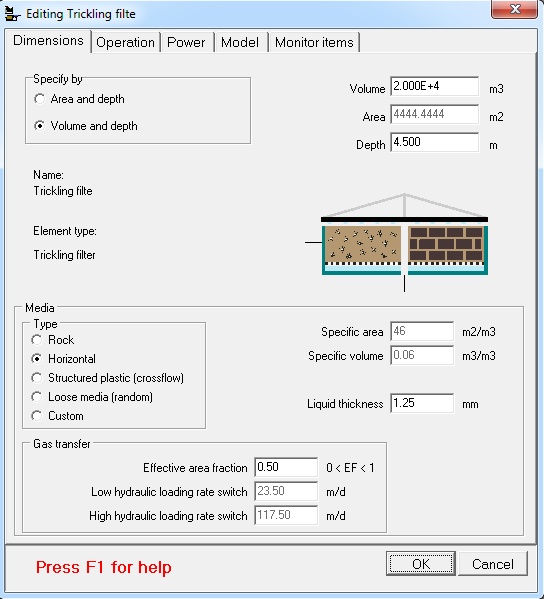 The user can specify the number of layers to use for modeling the biofilm attached to the media and the liquid boundary layer thickness. The BioWin configuration (Figure 4) below is set up for a trickling filter/ solids contact (TF/SC) pilot-plant process (Parker et al., 1998). The averages of the flow, temperature, and BOD loads are calculated and used as the constant influent inputs in BioWin. The averages of the TF effluent parameters such as BOD and ammonia, average MLSS of the contact tank, and the average final effluent parameters are calculated for comparison with the simulation results (Table 1). The removal rate of the primary settler is set as 78% to match the primary effluent parameters (and hence the BOD load on the TF) shown in Table 1. A steady state solution is found with BioWin default parameters. Maximum concentrations of microorganisms and particulate COD components in the biofilm (Project > Parameters > Bioflm…): These parameters were increased to allow more particulate material (including biomass) to attach to the biofilm without the biofilm becoming too thick. Boundary layer thickness (Model tab of the TF element): This value is changed from default 100nm to 54nm. This parameter impacts the degree of DO penetration into the biofilm. A reduced liquid boundary layer allows for more DO to penetration which allows / aids nitrification in the film. The value selected was based on matching the observed TF effluent ammonia level. Ammonia oxidizing bacteria maximum specific growth rate (Project > Parameters > Kinetic… > AOB): This parameter is changed from default 0.9/d to 0.75/d to better simulate the degree of nitrification in the solids contact tank and hence the effluent ammonia concentration. OHO Substrate half-saturation (Project > Parameters > Kinetic… > OHO): The half-saturation coefficient for OHO growth on readily biodegradable COD was increased to 20mg/L to increase the predicted final effluent BOD. Wasted sludge through splitter: The paper reported an SRT between 3 and 4 days. The waste activated sludge (WAS) flow was adjusted to balance agreement with this range and also maintain a good match between predicted and observed solids contact MLSS. A WAS flow resulting in a predicted SRT of ~3.6 days gave a good match to observed solids contact MLSS. The following figures show a comparison between the steady state simulation results and measured data. Figure 5 shows the simulated ammonia gradient down the depth of the TF. 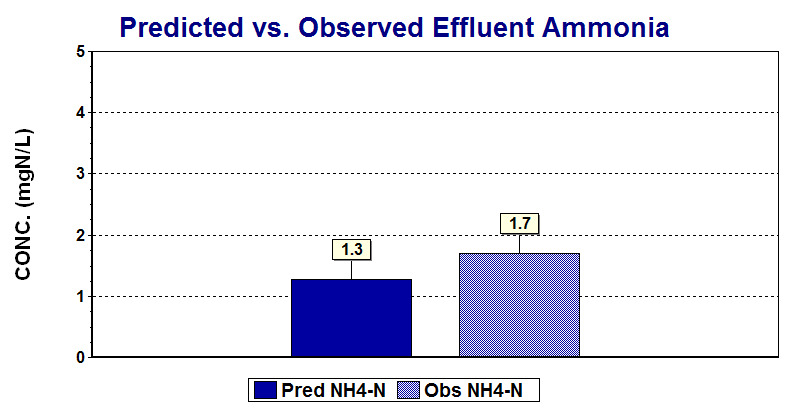 Figure 6 shows the predicted and observed ammonia concentration in the TF effluent. Figure 5 – Simulated bulk liquid ammonia gradient through the trickling filter depth. 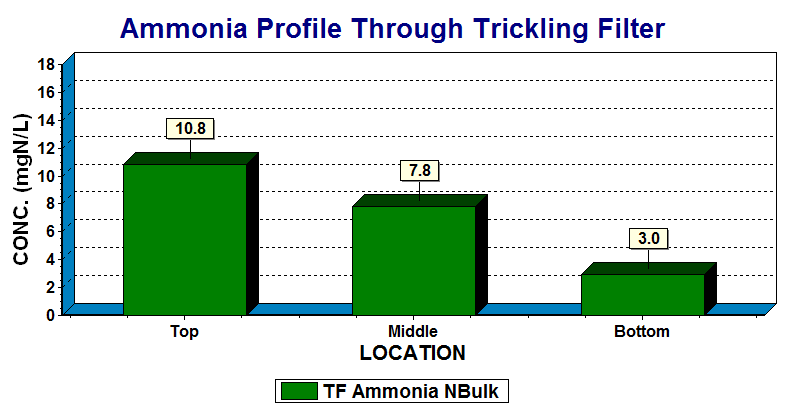 Figure 6 – Predicted and observed TF effluent ammonia. Figure 7 shows the good match between predicted and observed solids contact tank MLSS at the ~3.6 day simulated SRT. 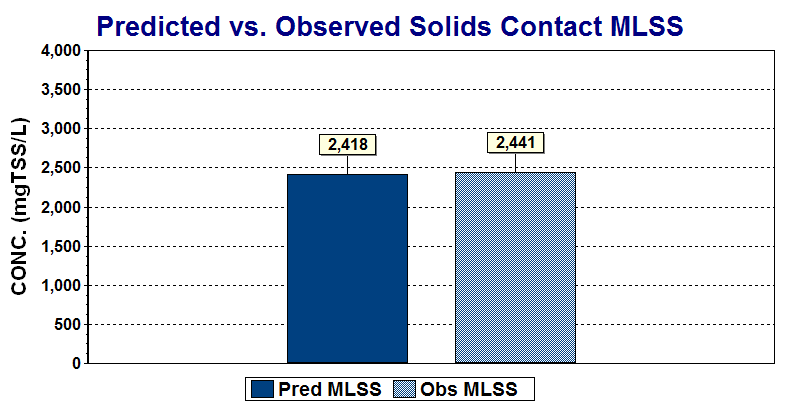 Figure 7 – Predicted and observed solids contact MLSS. Figures 8, 9, and 10 show generally good agreement between predicated and observed effluent parameters. 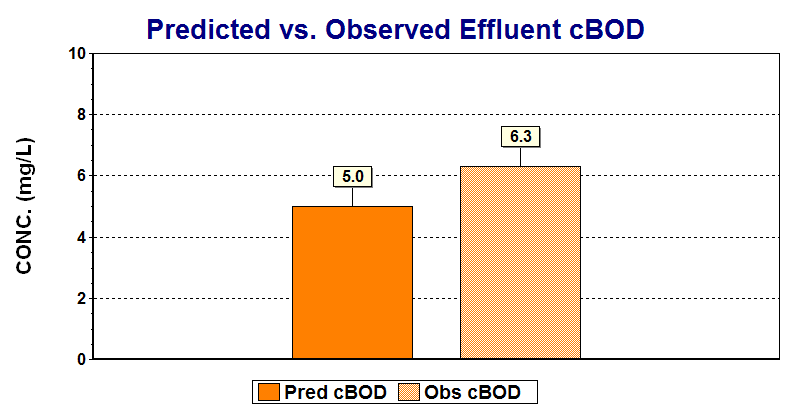 Figure 8 – Predicted and observed pilot plant effluent cBOD. 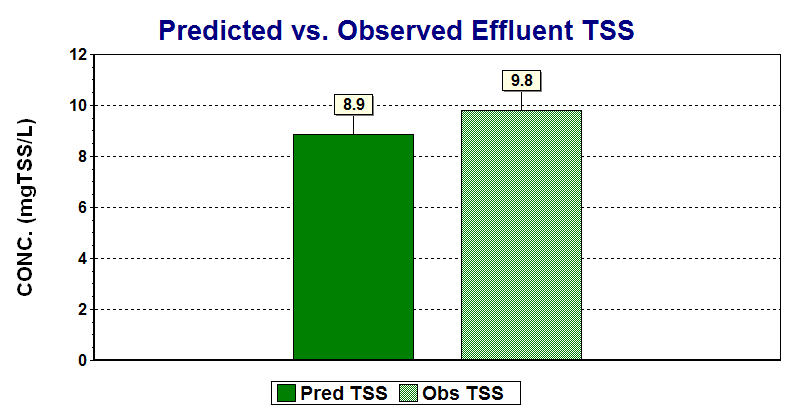 Figure 9 – Predicted and observed pilot plant effluent TSS. Figure 10 – Predicted and observed pilot plant effluent ammonia. In this document, we introduced BioWin’s trickling filter element and described its key parameters and concepts. The trickling filter element was used in a TF/SC configuration to simulate pilot plant performance (Parker et al., 1998). This exercise demonstrated the adjustment of various model and trickling filter element parameters to improve the match between the model results and the observed data. We trust that you found this technical topic both interesting and informative. Please feel free to contact us at info@envirosim.com (Subject: The BioWin Advantage) with your comments on this article or suggestions for future articles. D. S. Parker, L. S. Romano, and H. S. Horneck (1998). Making a trickling filter/solids contact process work for cold weather nitrification and phosphorus removal. Water Environment Research, 70(2), 181-188. P. Reichert and O. Wanner (1997). Movement of solids in biofilms: significance of liquid phase transport. Water Science & Technology, 36(1), 321-328. O. Wanner and P. Reichert (1996). Mathematical modeling of mixed-culture biofilms. Biotechnology and Bioengineering, 49, 172-184.